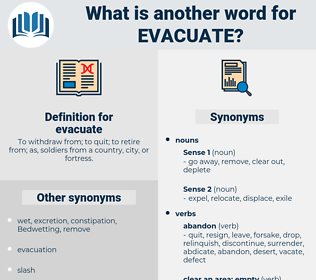 What is another word for evacuate? To withdraw from; to quit; to retire from; as, soldiers from a country, city, or fortress. Vacated, cancelled, abandoned, violated, cleared, breaches, broke, released, Gave, dropped. 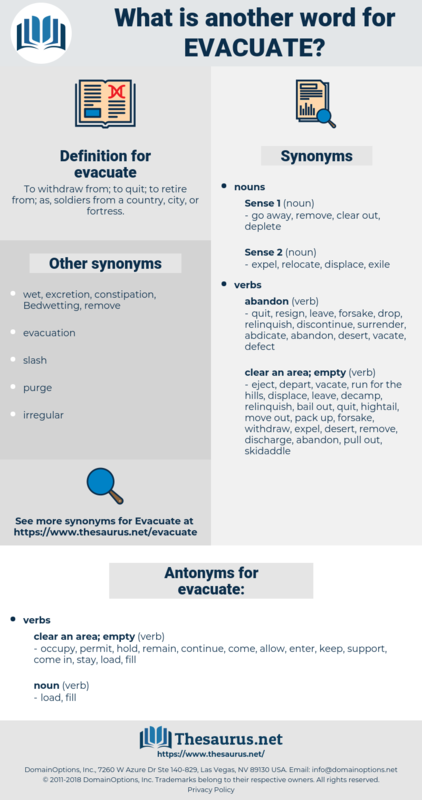 vacate, leaving, flee, abandon, dismantle, relocate, disperse, repatriate, dispose, extract, eliminate, Eliminating, emigrate, exit, extradite, expel, move, cas-evac, quit, depart. occupy, permit, hold, remain, continue, come, allow, enter, keep, support, come in, stay, load, fill. Prince George had invaded Crete in February, but the powers compelled him to evacuate the island. 7, It is necessary to open and evacuate the Bowels, where a great Quantity of corrupt Humours is generally lodged. ephestia, effectuate, evict, effect, evacuated, evoked, effected, episode.